Airwave Europe recently upgraded the entire TV infrastructure of the Pomme d’Or Hotel in Jersey, part of the Seymour Group, to allow free-to-air satellite reception, including hundreds of channels from across the globe in many different languages. Airwave installed the IRS TV network while the existing network was still running, allowing the hotel to remain open throughout. 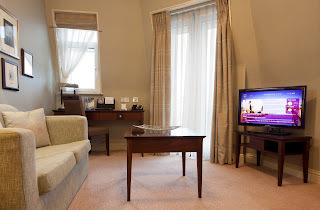 Samsung 32” LED Hospitality TVs were fitted into the guest rooms, which pick up the satellite reception and offer guests a vast range of channels with many in HD. Wayne Bowring, Airwave’s Key Account Manager, comments: ‘These screens are perfect for the Pomme d’Or as they cater for their international guest mix, as well as creating an elegant focal point to the guestrooms’. Airwave also installed AirINFO, our own full HD Hotel Information Channel, which was tailored for the hotel. The channel incorporates images and video as well as information on hotel services and local news and weather.